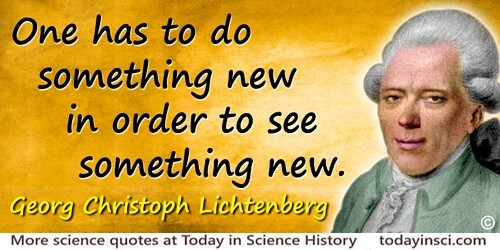 German physicist and writer most widely known for his satire and aphorisms, but as a scientist, Lichtenberg did research in a wide variety of fields, including geophysics, volcanology, meteorology, chemistry, astronomy, mathematics, but especially physics. 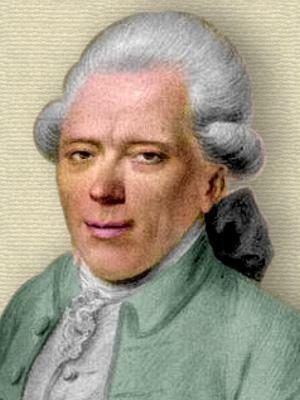 He discovered the basic physical process later used in xerographic copiers. Non cogitant, ergo non sunt. A good method of discovery is to imagine certain members of a system removed and then see how what is left would behave: for example, where would we be if iron were absent from the world: this is an old example. Aphorism 258 in Notebook J (1789-1793), as translated by R. J. Hollingdale in Aphorisms (1990). Reprinted as The Waste Books (2000), 181. Therefore a leg of mutton is better than Heaven. Aphorism 21 in Notebook C (1772-1773), as translated by R.J. Hollingdale in Aphorisms (1990). Reprinted as The Waste Books (2000), 35. Above all things expand the frontiers of science: without this the rest counts for nothing. Aphorism 262 in Notebook J (1789-1793), as translated by R. J. Hollingdale in Aphorisms (1990). Reprinted as The Waste Books (2000), 181. Aphorism 23 in Notebook C (1772-1773), as translated by R.J. Hollingdale in Aphorisms (1990). Reprinted as The Waste Books (2000), 35. Do not say hypothesis, and even less theory: say way of thinking. Aphorism 263 in Notebook J (1789-1793), as translated by R. J. Hollingdale in Aphorisms (1990). Reprinted as The Waste Books (2000), 181. Aphorisms (1775-1779) trans. Franz H. Mautner and Henry Hatfield. In Fred R. Shapiro and Joseph Epstein, The Yale Book of Quotations (2006), 459:3. Everywhere in nature we seek some certainty, but all this is nothing more than an arrangement of the dark feeling of our own. All the mathematical laws that we find in Nature are always suspicious to me, despite their beauty. They give me no pleasure. They are merely expedients. Everything is not true at close range. From the original German, in Physikalische und Mathematische Schriften (1806), Vol. 4, 145, “Wir suchen in der Natur überall eine gewisse Bestimmtheit, aber das Alles ist weiter nichts, als Anordnung des dunkeln Gefühls unserer eigenen. Alle mathematischen Gesetze, die wir in der Natur finden, sind mir trotz ihrer Schönheit immer verdächtig. Sie Freuen mich nicht. Sie sind bloss Hülfsmittel. In der Nähe ist Alles nicht wahr.” English version by Webmaster using Google translate. God created man in his own image, says the Bible; the philosophers do the exact opposite, they create God in theirs. Aphorism 48 in Notebook D (1773-1775), as translated by R.J. Hollingdale in Aphorisms (1990). Reprinted as The Waste Books (2000), 51. He had constructed for himself a certain system which thereafter exercised such an influence on his way of thinking that those who observed him always saw his judgment walking a few steps in front of his feeling, though he himself believed it was keeping to the rear. Aphorism 82 in Notebook D (1773-1775), as translated by R.J. Hollingdale in Aphorisms (1990). Reprinted as The Waste Books (2000), 56-57. He marvelled at the fact that the cats had two holes cut in their fur at precisely the spot where their eyes were. Aphorisms, trans. R. J. Hollingdale (1990), 108. 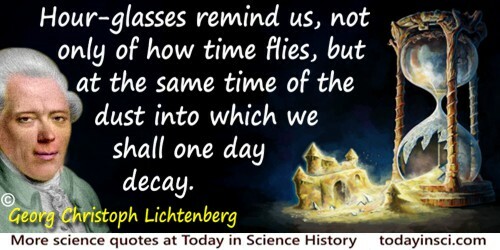 Hour-glasses remind us, not only of how time flies, but at the same time of the dust into which we shall one day decay. Aphorism 4 in Notebook C (1772-1773), as translated by R.J. Hollingdale in Aphorisms (1990). Reprinted as The Waste Books (2000), 31. I have often noticed that when people come to understand a mathematical proposition in some other way than that of the ordinary demonstration, they promptly say, “Oh, I see. That’s how it must be.” This is a sign that they explain it to themselves from within their own system. Lichtenberg: A Doctrine of Scattered Occasions: Reconstructed From: Reconstructed From His Aphorisms and Reflections (1959), 291. I know very well the people you mean: they are all mind and theory and haven't the wit to sew on a button. Plenty of head but not hand enough to sew on a button. Aphorism 75 in Notebook D (1773-1775), as translated by R.J. Hollingdale in Aphorisms (1990). Reprinted as The Waste Books (2000), 55. I once lodged in Hanover in a room whose window gave on to a narrow Street which formed a communicating link between two bigger streets. It was very pleasant to see how people's faces changed when they entered the little Street, where they thought they were less observed; how here one pissed, there another fixed her garter, one gave way to private laughter and another shook his head. Girls thought with a smile of the night before and adjusted their ribbons for conquests in the big Street ahead. Aphorism 19 in Notebook C (1772-1773), as translated by R.J. Hollingdale in Aphorisms (1990). Reprinted as The Waste Books (2000), 34. If we make a couple of discoveries here and there we need not believe things will go like this for ever. An acrobat can leap higher than a farm-hand, and one acrobat higher than another, yet the height no man can overleap is still very low. Just as we hit water when we dig in the earth, so we discover the incomprehensible sooner or later. Aphorisms, trans. R. J. Hollingdale (1990), 92. Imagine the world so greatly magnified that particles of light look like twenty-four-pound cannon balls. As given, without source, in James Geary, Geary's Guide to the World's Great Aphorists (2008), 341. In mathematical analysis we call x the undetermined part of line a: the rest we don’t call y, as we do in common life, but a-x. Hence mathematical language has great advantages over the common language. Lichtenberg: A Doctrine of Scattered Occasions: Reconstructed From: Reconstructed From His Aphorisms and Reflections (1959), 158. It is a good thing Heaven has not given us the power to change as much of our body as we would like to or as our theory would assert is necessary. Aphorism 34 in Notebook D (1773-1775), as translated by R.J. Hollingdale in Aphorisms (1990). Reprinted as The Waste Books (2000), 48. It is very much in the order of nature that toothless animals should have horns: is it any wonder that old men and women should often have them? Aphorism 6 in Notebook E (1775-1776), as translated by R.J. Hollingdale in Aphorisms (1990). Reprinted as The Waste Books (2000), 62. Many people know everything they know in the way we know the solution of a riddle after we have read it or been told it, and that is the worst kind of knowledge and the kind least to be cultivated; we ought rather to cultivate that kind of knowledge which enables us to discover for ourselves in case of need that which others have to read or be told of in order to know it. Aphorism 89 in Notebook D (1773-1775), as translated by R.J. Hollingdale in Aphorisms (1990). Reprinted as The Waste Books (2000), 58. Metaphorical language is a species of natural language which we construct out of arbitrary but concrete words. That is why it is so pleasing. Aphorism 78 in Notebook D (1773-1775), as translated by R.J. Hollingdale in Aphorisms (1990). Reprinted as The Waste Books (2000), 56. Aphorism 2 in Notebook C (1772-1773), as translated by R.J. Hollingdale in Aphorisms (1990). Reprinted as The Waste Books (2000), 31. Now that we know nature thoroughly, a child can see that in making experiments we are simply paying nature compliments. It is no more than a ceremonial ritual. We know the answers in advance. We consult nature in the same way as great rulers consult their parliaments. Aphorism 67 in Notebook E (1775-1776), as translated by R.J. Hollingdale in Aphorisms (1990). Reprinted as The Waste Books (2000), 73. Of all the animals on earth, man is closest to the ape. Aphorism 19 in Notebook B (1768-1771), as translated by R.J. Hollingdale in Aphorisms (1990). Reprinted as The Waste Books (2000), 21. Aphorism from Notebook J (1789). Aphorism 58 in Notebook D (1773-1775), as translated by R.J. Hollingdale in Aphorisms (1990). Reprinted as The Waste Books (2000), 52. The accomplishments of those born blind are a sure proof of how much the spirit can achieve when difficulties are placed in its way. Aphorism 50 in Notebook D (1773-1775), as translated by R.J. Hollingdale in Aphorisms (1990). Reprinted as The Waste Books (2000), 51. 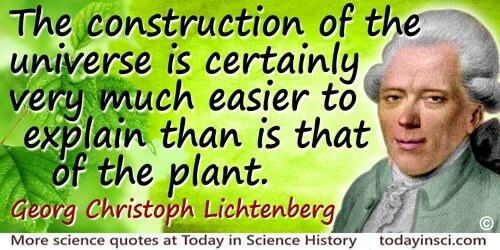 The construction of the universe is certainly very much easier to explain than is that of the plant. Aphorism 4 in Notebook J (1789-1793), as translated by R. J. Hollingdale in Aphorisms (1990), 119. Reprinted as The Waste Books (2000), 128. Aphorism 55 in Notebook E, as translated by R.J. Hollingdale in Aphorisms (1990). Aphorism 74 in Notebook D (1773-1775), as translated by R.J. Hollingdale in Aphorisms (1990). Reprinted as The Waste Books (2000), 55. Aphorism 70 in Notebook D (1773-1775), as translated by R.J. Hollingdale in Aphorisms (1990). Reprinted as The Waste Books (2000), 55. There are two ways of extending life: firstly by moving the two points “born” and “died” farther away from one another… The other method is to go more slowly and leave the two points wherever God wills they should be, and this method is for the philosophers. Aphorism 22 in Notebook B (1768-1771), as translated by R.J. Hollingdale in Aphorisms (1990). Reprinted as The Waste Books (2000), 21. Aphorism 72 in Notebook K, as translated by R.J. Hollingdale in Aphorisms (1990). We have to believe that everything has a cause, as the spider spins its web in order to catch flies. But it does this before it knows there are such things as flies. Aphorisms, trans. R. J. Hollingdale (1990), 112. 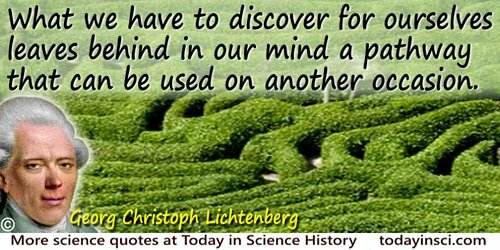 What we have to discover for ourselves leaves behind in our mind a pathway that can be used on another occasion. Aphorism 3 in Notebook J (1789-1793), as translated by R. J. Hollingdale in Aphorisms (1990). Reprinted as The Waste Books (2000), 128. You can be sure you are acting in accordance with the designs of nature if what you do is calculated to promote nature's great final purpose: grow and make grow. I am firmly convinced of the universality of this law. Aphorism 44 in Notebook D (1773-1775), as translated by R.J. Hollingdale in Aphorisms (1990). Reprinted as The Waste Books (2000), 50. [Someone] remarked to me once: Physicians should not say, I have cured this man, but, This man didn’t die in my care. In physics too one might say, For such and such a phenomenon I have determined causes whose absurdity cannot finally be proved, instead of saying, I have explained it. As quoted in Joseph Peter Stern, Lichtenberg: A Doctrine of Scattered Occasions: Reconstructed From His Aphorisms and Reflections (1959), 297. 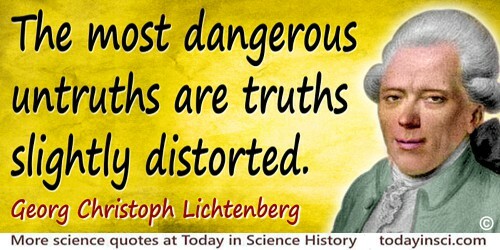 1 Jul - short biography, births, deaths and events on date of Lichtenberg's birth.